Cleaning your gutters is one of the most important maintenance tasks of any property. Sadly, gutter cleaning is often overlooked or not done frequent or complete enough. Which is one of the many reasons to hire a professional gutter company who can ensure your gutters are free flowing year-round. We recommend cleaning your gutters at least two times a year and properly inspecting your rain gutter system for signs of wear and tear. Repairing a loose or damaged gutter system before it becomes a much bigger more expensive issue. Gutters have a job to perform, directing water off your property and into a safe direction. When gutter cleaning and maintenance are not performed regularly gutters can fail to their job, causing property damage in several ways. Below are some of the common issues that arise from not properly cleaning and maintaining you gutter system. One of the most common reasons people find water in their basement is due to a faulty rain gutter system. A gutter that is clogged or not properly functioning can allow water to overflow into the ground below, seeping into your basement within a very short period of time. The water can then cause massive damage to items in the basement or materials such as sheetrock the basement maybe finished off with. Further, a basement is molds best friend, typically providing an ideal environment for mold to thrive. A clogged gutter or damaged gutter just can’t do its job properly and allows water to take the path of least resistance, which is typically over the rim and onto your property. This allows the water to accumulate and saturate the ground in areas that are very harmful to your property. Even causing integrity concerns as the water allows the foundation to settle lower in the saturated area. This can result in cracks and uneven foundation, sometimes visible in the interior walls as they adjust with the foundation. Our roofs are one of our most important components of our homes or buildings. They protect the interior from the elements and environment outside. When roofs fail and start to leak it’s usually very costly to repair not only the roof but the interior as well. One of the common ways roofs start to leak is from the gutter system. A gutter system that is clogged and not flowing properly in the late fall and winter can allow water to freeze over the gutter pushing the gutter away from the roof. As well when the winter brings snow and it thaws, the water can become dammed up on the roof, due to frozen and clogged gutters. Allowing it to get into your house causing serious interior damage. Rain Gutters have a simple job to do, direct water to a safe destination. A properly cleaned and maintained gutter does its job very well and can extend the life of your home or building. A failed gutter system rather from not being clean or damaged can allow rain water into areas which cause your home serious and expensive damage. The Siding and exterior walls are one main area we see water damage occur from a faulty gutter system. As water seeps over or through the gutter it can run directly down your building getting between the siding and walls, requiring major repairs. Damage can also happen to the interior walls in this same way as water is uncontrolled, as intended by the gutter, and seeps into ever area possible. 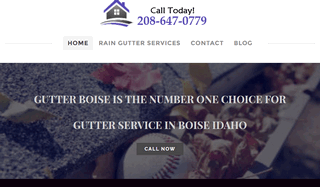 We all love our landscapes here in the Boise area and failing to clean your gutters can washout and ruin what we work so hard to maintain. Since the gutter is not clean and free flowing it can allow for water to find an easier way to the ground. Allowing it to wash away our landscapes and drown out our vegetation. As you can tell having your gutters cleaned regularly and maintained properly is extremely important to the health of your property. Hiring a professional is the best way to ensure a properly functioning rain gutter system.